The real estate brokerage found that Houston's apartment vacancy rate is currently 5.8 percent but is expected to climb to 7 percent by the end of the year as a wave of new apartments hit the market. Last year, Houston's apartment vacancy rate began to tick up for the first time since 2010. 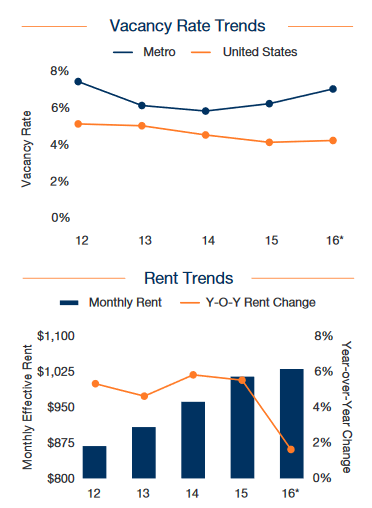 In 2015, the Bayou City's apartment vacancy rate went up by 40 basis points. This year, the city's vacancy rate is expected to increase by 80 basis points, according to Marcus & Millichap. 1 basis point is equal to one hundredth of 1 percent. Developers are expected to deliver 27,600 apartment units in Houston in 2016, setting a new construction record for deliveries in a single calendar year. The increased vacancy rate will force apartment operators to continue offering rent concessions of between two to three months. Rent growth is slowing down amid the oil slump and oversupply, and is expected to inch up just 1.6 percent in 2016 compared to 5.5 percent in 2015. Did someone say free? Check out FREE data and reports under Houston's Multifamily Market Research.